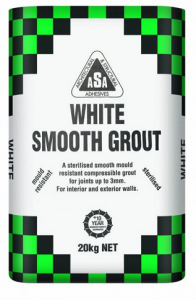 ASA White Smooth Grout is a smooth anti-microbial and hydrophobic compressible grouting mixture that has been designed to give tile joints a satin-like appearance. White Smooth Grout is recommended for ceramic tiles, natural stone and mosaic tiles for joints up to 3mm wide. Suitable for internal wall applications.